Disclosure: I am an OtterBox ambassador but all thoughts and opinions are my own. This post contains affiliate links. How would you like to have a dance party with Woody and Jessie from Toy Story? Or hear a story from “under the sea” directly from Princess Ariel herself? Or go on an adventure with Mickey Mouse? Thanks to our Google Home Mini and its apps from Disney, you and your family can enjoy amazing, interactive games and experiences right from your little one’s bedroom! And with OtterBox’s exclusive Mickey Mouse stand, you and your family can play games and experience all of Google Home‘s fantastic features just by talking into Mickey’s famous ears! Technology is a big part of our lives, but we want to keep from depending too much on screen time for our entertainment. 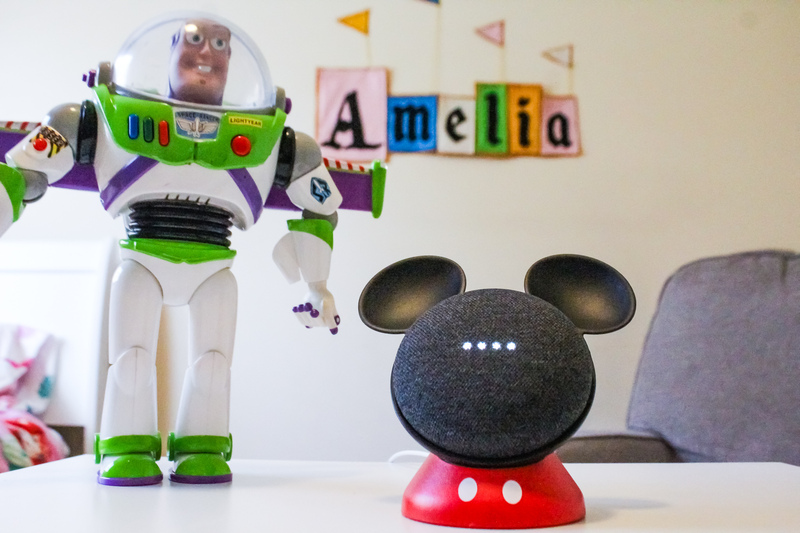 The Disney apps on the Google Home Mini is a great way to have fun with new devices, but stay active and imaginative! My daughter Amelia can’t wait until it’s time to play with our Google Home Mini, where she can request a story told by her favorite Disney Princess, Tiana! She doesn’t have to deal with buttons or screens, all she has to say is “Hey Google, play Disney Princess!” and the princesses take care of the rest! Tiana tells an interactive story where she will occasionally ask Amelia for advice. Amelia’s responses help form the story and maybe even change the outcome! Another favorite in our home is accessed by saying “Hey Google, play Toy Story Freeze Dance!” Woody and Buzz and the other toys of Bonnie’s Room welcome Amelia in as a new toy, and she has to learn how to freeze when Bonnie walks in! After Amelia is given the choice of which tape cassette Jessie should play, Sarge the Green Army Man instructs us all how to dance and then freeze as soon as the music stops! With many different selections of songs and dances, we never get bored learning the new dances the toys teach us. There are many other Disney games included in the Google Home Mini, including Maui’s Music Game and Star Wars Trivia, in addition to all the other great trivia and story-based games you can find by asking Google questions. And if you have Google Chromecast on your TV, you can even tell your Google Home Mini to turn on a movie by saying “Hey Google, play Coco on Netflix!” for some quality family time entertainment. But the Google Home Mini wouldn’t be complete without an awesome stand to display it. The OtterBox Den Series featuring Mickey Mouse is the perfect companion to the Google Home Mini, transforming the small disc-like speaker into the mouse who started it all. It looks great anywhere in the house, and our daughter loves its friendly shape! Fun and adventure are just a “Hey Google!” away!